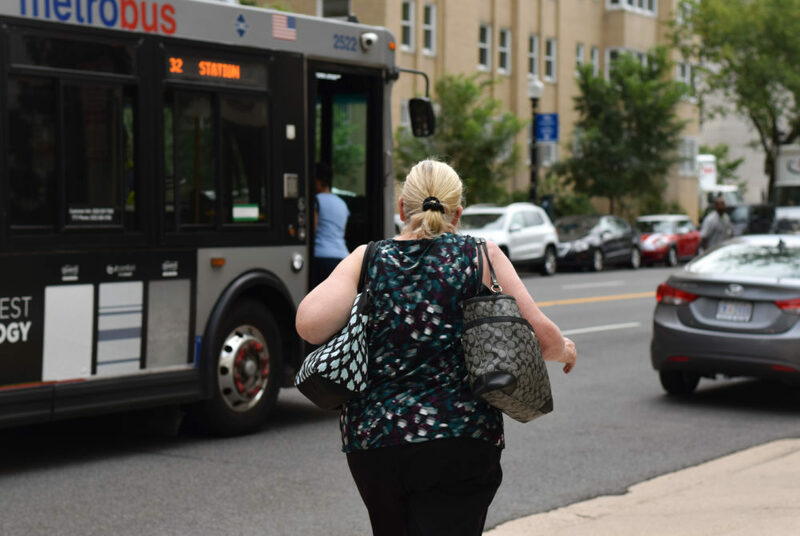 Taking the Metro bus can be a cost-effective and fast way to travel around the District. Navigating a new campus can be tough as a freshman — and a new city is even harder. Even if you’re a rising senior and feel like a District local, you may need a refresher on how to best utilize public transportation and avoid the high costs of Uber and Lyft rides. Here are all the tips you need to master D.C.’s transportation and explore the city. The Metro has lines running throughout the city and to other popular locations just outside the District in Maryland and Virginia. Metro has become known for the headaches it can cause because of delays and closings for renovations, but it’s typically an easy way to reach popular destinations like Reagan National Airport, the Capitol Building and U Street. To travel on the six color-coded lines, you will need to buy a SmarTrip card at one of the kiosks inside each station or at a CVS store. The card costs $10 and comes with $8 loaded on it for travel. Fares depend on the timeframe and the distance traveled, with times designated as “peak” and “off-peak,” but have a minimum cost of about $2. Maps are posted around each station, making it easy to follow the orange, blue, silver, red, green and yellow lines to your destination. You can find a Metro station from the street by looking for a column with a large “M” on it and colored lines indicating which lines serve that station. Luckily for students, you don’t have to go too far – the Foggy Bottom-GWU station is located on campus at 2301 I St. and has the blue, orange and silver lines. Because the Metrorail is limited to just six lines, the Metrobus can get you to your exact location as it traverses the city. The bus is usually cheaper with a $2 flat rate and is more reliable, but make sure to be on time and stand on the right side of the street to catch the bus you want. Use Google Maps or the Metro timetables to find which bus route is fastest and closest. With 11,500 bus stops throughout the city, Maryland and Virginia, there are lots of options to get you almost anywhere. Head to the bus stop, wait for the correct numbered bus to come and either use a SmarTrip card or cash to pay once you get on. To get off, pull the cord near the seats and exit the bus through the doors once it stops. If you can’t wait around for the next form of public transportation to arrive, hop on a Capital Bikeshare bike and take a ride around the city for scenic travels and exercise. First, join online or purchase a short-term pass at a kiosk – $2 for a single trip under 30 minutes, $8 for a day or $85 for a year – to unlock a bike at a nearby station and then return it to any station. There are a few stations on and around campus, including at 21st and I streets and at 22nd and H streets, the latter of which was installed in front of Duques Hall in July. A map on the website shows the 440 station locations and availability for the 3,700 bikes around the city. Capital Bikeshare also offers an application for iPhones and Androids that shows the stations and bike availability, allowing for the purchase of a single ride or 24-hour pass and offering ride statistics including the number of rides you’ve taken and miles you’ve traveled. Best of all, the bikes are available 24/7 so you don’t have to worry about planning your trip around certain hours.